Puff the magic pastry is flaky as can be. And frolics in the oven’s heat in a land that’s buttery. So I found an online baking group, which you may have noticed the link on the left, called the Daring Kitchen. They have a cooking side and a baking side; I obviously chose the latter. Every month, a challenge is set. And my first challenge was vols-au-vent. The recipe can be found here. 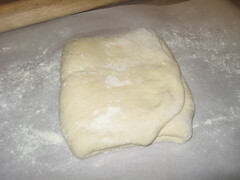 I have never made puff pastry before, nor was it high on my to-learn list. Not because it isn’t delicious, because I think we all agree that it is. 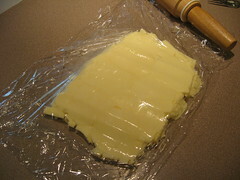 But because of the high fat content (1 pound of butter!). Nonetheless, I am not one to back down from a challenge. The recipe to follow was put up and it went completely over my head. Something about a lot of butter, and making turns, and fold the dough like a book… what??? Thank God for YouTube. I found an excellent video on making puff pastry from two girls who studied at Le Cordon Bleu in Paris. I figured out how to incorporate the butter with a series of six “turns,” and to fold the dough in thirds like a book, keeping the butter cold the entire time. This process keeps the flour mixture and the fat layered to achieve maximum rise in the oven. What genius came up with that? Brilliant! Once the dough was made and well chilled, I rolled some out and cut them in circular shapes to make my vols-au-vent. A little docking here and a little egg wash there and they were ready to rise to fame and glory. 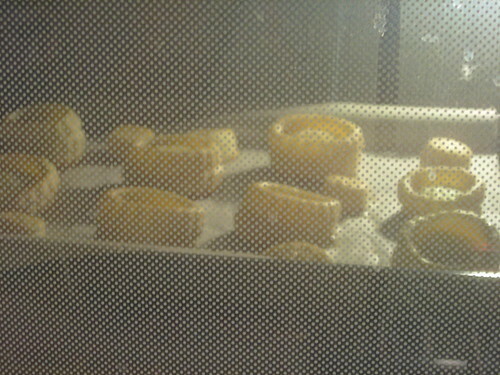 I found myself watching through the window in the oven and cheering them on like a sports match. 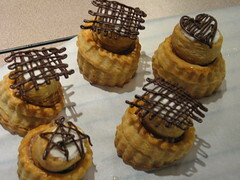 The puffs puffed perfectly (try saying that 5 times fast) and didn’t deflate like my failed chocolate souffles. Not only did they turn out great, but they were actually really fun to make. I may not want to eat a whole lot of it (actually I do, but I must practice willpower so I don’t puff up too), but I can foresee making many batches of puff pastry in the future. The vols-au-vent weren’t finished until they were filled. 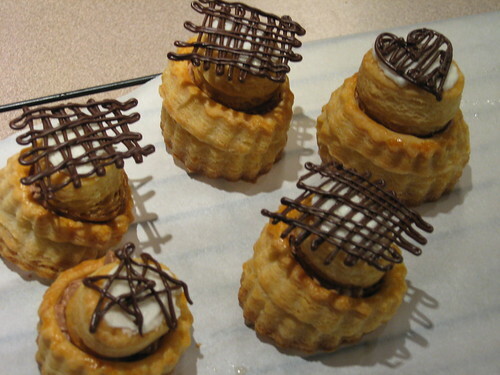 Rather rushed, I put some melted chocolate on the bottom inside of the shells and topped with chocolate whipped cream. 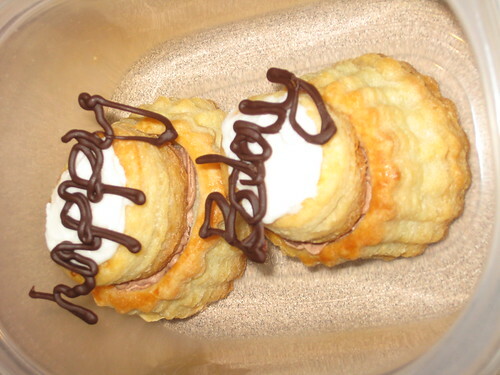 I also put a dollop of vanilla icing on the tops to adhere chocolate designs to. The pastries were buttery and flaky and reminded me of France, but the cream was a little subtle. 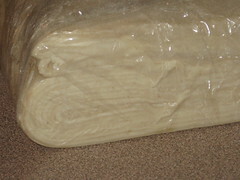 I froze half of my puff pastry dough to make millefeuilles, or napoleons, another day. Mmm.. millefeuilles. I drool like Homer Simpson when I think of those. Make sure to stop by at the end of October for another baking challenge. Lesson 8: It’s Banana’s, B-A-N-A-N-A-S. Things have slowed in the kitchen, but they’re about to pick back up. I have a couple of exciting lessons planned, all new and never been attempted before. You don’t want to miss this! Good pitch? I hope so. This last week, I took it fairly easy. But I had a craving for banana pudding. I also wanted to make one of my favourite recipes from my Irish cookbook for potato and leek soup. –Did you catch the “u” in favourite? — So imagine me (and when you do so, please imagine me in an adorable Nanette Lepore dress with Christian Louboutin shoes, and maybe 15 pounds lighter), stirring potato and leek soup with my left hand and whisking vanilla pudding with my right. Now that’s multitasking! I noticed the vanilla pudding get to the thicker stage and decided that it was much needier than the soup, so I focused my attention on that. The lumps that were starting to form were fortunately repairable. But the pudding was a little thicker than I wanted it . . . must have been the dash of cornstarch I put in it. But what’s a pudding without cornstarch? I layered the pudding with the ‘nilla wafers and bananas and voila! My first banana pudding. It would have been better with a meringue on top, like my mom always makes, but the soup was starting to fuss. You know how it is. Once one gets attention, you have to give it to the other one too. That was really the extent of my baking week: two craving’s satisfied. And it’s getting harder to imagine myself 15 pounds lighter while doing this baking project. Help Wanted: Taste testers in the Scottsdale/Phoenix area. Unpaid. Lesson 7: What’s up, cream puff? That is exactly what I said to my cream puffs on Labor Day. Okay, not really. But I thought it . . . just now . . . not then . . . cause I’m not THAT quick-witted. And I guess it wasn’t really THAT witty anyways. I was self-assigned to dessert on Labor Day for our lil’ family BBQ, and rather than make the always classic chocolate brownies, I decided to make profiteroles which are pretty much cream puffs with a chocolate ganache, or I guess they’re pretty much eclairs. I figured that would please the masses (because I have such a large family: mother, father, brother, grandmother, and grandfather) and it would be something I’ve never tried before. The recipe was so simple it surprised me: butter, flour, eggs, and water. I added sugar too because, come on, this is dessert! I got the recipe out of my British cookbook. Don’t start . . . British food is fine. When the profiteroles were mixed and baked, they had a nice golden brown doneness to them. Perfect! Or not. 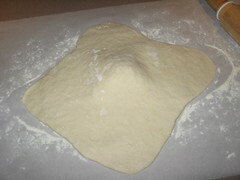 When I whipped up the whipped cream and cut a puff to fill, I saw dough. Now some people in my family (ahem, Mom) like undercooked baked goods, but a taste-test proved that these were unacceptable. The shells were tossed in the garbage and the whipped cream was placed in the refrigerator for another day, another lesson. Our guests had arrived and there was no dessert. So much for learning a new skill; brownies to the rescue. I quickly mixed up some brownie batter and got that baking while we ate lunch. The brownies were delicious, but it’s old hat. This blog is not intended for me to bake things I already know how to bake well. Later that night, I brought out the sugar cookie cutouts I had baked a few days ago in order to decorate them and take to Scottish musician Paolo Nutini. I had my assistant (friend) Lindsey help on the assembly line to get them done relatively fast. I did a base coat on each cookie with buttercream frosting, because it just tastes better than icing, then spread icing on top which gave it a smooth, shiny finish, and also hardened a bit so that the cookies wouldn’t stick together if they got a bit warm. They did have to make the trip to Tucson with me. The worst thing that can happen to sugar cookies with buttercream frosting is to spend a lot of time on detail work and then find the cookies stuck together and smudged after packaging and transporting. The cookies turned out nice, and they were successfully delivered — I found a man standing by Paolo’s tour bus who had a Scottish accent. Next time, Paolo requests weed cookies. He was just kidding! I don’t want to get the kid in trouble. Next order of business was to thaw out the failed chocolate cake from the previous lesson. Yeah, I didn’t trash it. I figured it needed a fair chance and not just a little taste from a silicon cupcake mold. I cut a small piece off the end of the cake and added a dab of chocolate frosting to find that it was actually pretty good. Well this just worked out great. I had one chocolate cake and one bowl of whipped cream. I put two and two together, literally, and added some chocolate frosting on top to make a chocolate layer cake with a light whipped cream filling. Half of it got eaten by my family and the other half went to work with me. I just can’t keep up with the eating part of this baking project, so my coworkers get to help. Overall, not a bad baking week. The profiteroles were pathetic, but I know next time that I need to bake them longer. Next lesson may be slightly delayed due to a possible mini trip to Los Angeles. But I know that puff pastry is in the cards because I am taking part in the monthly baking challenges from the baking club The Daring Kitchen. 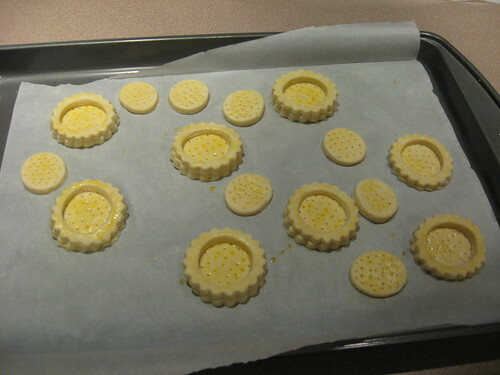 I have never made a french pastry like that before, should be interesting. I better stock up on butter. I think I’m starting to get lazy and careless. This is not good seeing as how I’ve only been at this for a month. I went to open mic night a week ago and decided to make some chocolate chip cookies to take to Walt, the man who runs it. He’s been requesting more ever since I made him some over a year ago. So I g0t out my favorite recipe for it and started mixing. When I got to the part about adding the sour cream (yes, it uses sour cream as the acid that counters with the baking soda), I decided to substitute lowfat plain yogurt since I had made a point of buying it, yet letting it nearly spoil in the refrigerator. I had already added the sugars though, but didn’t feel like the addition of a LITTLE more sugar would cause harm. I also added the additional one cup of flour more than the recipe calls for so as not to end up with chocolate chip flat-as-a-pancake cookies. First tray comes out of the oven and what do I have? Chocolate chip flat-as-a-pancake cookies. No problem, those will be the reject cookies set aside for my family (They can’t complain. The cookies still tasted good). I stirred in more flour and the next batch was better. Still a little flatter than I like, but I once added a lot of extra flour to the batter and ended up with high and dry cookies. The extra sugar from the yogurt made these pretty sweet, but not in a bad way. The gold-star cookies went to Walt, with a few leftover for Matt the Electrician‘s wingman Scrappy Jud Newcomb. Next baking project was a bit more important because the result would be consumed by my friends. I wouldn’t exactly call them critics, but I have a reputation to uphold. Once again, a look in my fridge showed me a bottle of buttermilk nearing expiration. So you know now that I don’t like to wash dishes (don’t worry, I DO wash them though) and I don’t like things that I’ve paid for go to waste. So I found a nice little chocolate cake recipe that called for buttermilk. Near the end up mixing up the batter, I went to add my dry ingredients and realized I only had about half the amount of cocoa powder that I needed. Well crap. I’m lazy and didn’t feel like making a grocery run, so I just added some hot cocoa mix. Probably not the best substitution, but the label said it had cocoa powder in it. To be on the safe side, I filled one muffin cup with the batter for taste-testing and baked it with the cake. Um… the outcome definitely would have raised questions about my baking ability. Not chocolaty enough, and no amount of rich frosting would have saved it. Into the garbage it went and out came the no-fail recipe for a chocolate chip cake. So I wasted the buttermilk and had to use even more ingredients. Fortunately I had every thing available for this cake, just had to run out to the grocery to buy more cocoa powder for the frosting. Alas, the trip was unavoidable. At this point, I had wasted quite a bit of time. Earlier in the day, I rolled out and baked all the sugar cookie dough I had made a few days ago. Then I made a failed chocolate cake. So once the good chocolate chip cake was baked and cooled, I didn’t have much time for decorations. And decorating is my favorite part! I love being creative. To make it simple but pretty, I figured I’d frost it with a rich chocolate buttercream and then make a little white chocolate bow and ribbon to go on it to look like a gift. I’ve made a 3D chocolate bow before by melting down chocolate and spreading it thin on waxed paper, then looping the paper so the chocolate ends touch eachother, and chill till hard. Then I take the chocolate loops (about 4 of them) and arrange them like a bow with a couple straight pieces as the ends. Bad explanation? See the “Piece of Cake” section for a picture. I melted down some white chocolate that was white/red swirled so that it would make a pink bow. The color actually came out quite red. Then to make it pretty and shiny, I added a couple drops of corn syrup. Whoa chocolate! What the hell?! The chocolate totally seized up into a lump. And it wasn’t even shiny! I went back to my lump of chocolate which had stubbornly separated from the water. Apparently, the two don’t get along. I dried the remaining water off the chocolate just like I blot all the nasty grease off pizza. Then I stuck the stuff into the freezer since I didn’t have two hours to chill it. Ten minutes later, the chocolate was super hard and unworkable. Back in the microwave it went, taking me right back to where I started. I took the now warm lump and kneaded it a bit. It still wasn’t very workable because it was kind of dry. It definitely didn’t want to be pulled like the pulled sugar (see Lesson 1). But like the pulled sugar, I got a rose made. Yes, it took several attempts before I got the finished product. But I proudly displayed the red rose on the cake and piped some white chocolate to say “Happy Birthday.” Underneath, I formed rose petals out of the molding chocolate and arranged them to say “Ali,” who was the birthday girl. All-in-all, pretty interesting day, definitely a long one. With the sugar cookies, two cakes, and decorations, I had been going from 11 am to 9 pm. But I think the birthday cake lived up to my reputation. Cookie Kelly can hold her head up high… for now. This little baker needs a few days off, at least until Monday, Labor Day. I also need to bake something for Paolo Nutini to take to his show on Tuesday.